DAKAR, May 04 (IPS) - As Sierra Leone, Guinea Bissau and Liberia work to end Ebola, critical healthcare services damaged by the epidemic are beginning to be revitalised. The launch of the campaign coincided with World Immunization Week, which ran Apr. 24 to 30. In Guinea, the World Bank has provided funding, whilst in Sierra Leone, funding has come from the Canadian International Development Agency, the European Union and the United States Office of Foreign Disaster Assistance. Speaking to IPS about the relevance of the campaign, UNICEF West Africa spokesperson Tim Irwin said, "The focus is still very much on getting to zero cases of Ebola, but the reduction in the number of cases has allowed for the resumption of some interventions. "Immunisations have restarted and UNICEF and partners have supported the governments in the reopening of schools." At the end of March, the World Health Organisation said "in light of the decline in Ebola cases, it is urgent to focus efforts on restarting and intensifying immunization activities." Currently, the risk of vaccine-preventable disease outbreaks outweighs the risk of increased Ebola virus transmission. 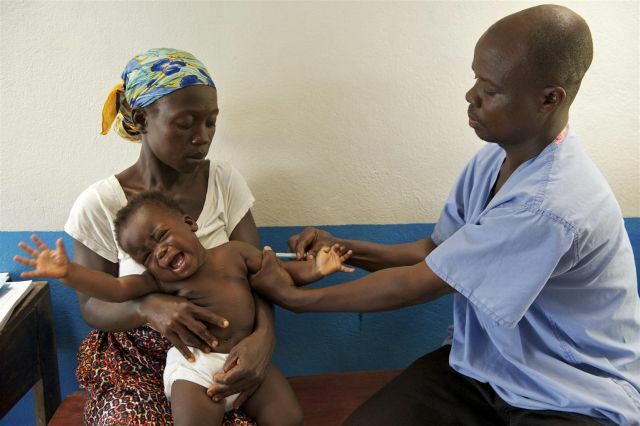 In Liberia, a campaign to provide measles and polio vaccinations to over 700,000 children under five years old is planned for May 8-14. There, measles vaccination rates were adversely affected due to the impact of Ebola on the country's healthcare infrastructure. Little more than half of children aged under one year received measles vaccines in 2014. Before the epidemic in 2013, measles coverage was 89 percent, while in 2014 it fell to 58 percent. Meanwhile, Ebola had a significant impact on Sierra Leone's vaccination regime, with routine vaccinations decreasing by 17 percent during the epidemic. Since the start of 2015, 21 laboratory confirmed cases of measles have been reported. In May, an immunisation drive for 1.5 million children under five will cover measles and polio. In Guinea, where a measles outbreak was declared in early 2014 - prior to Ebola - the number of confirmed measles cases increased almost fourfold, from 59 between January and December 2013 to 215 for the same period in 2014, according to WHO. There are currently some 1265 suspected cases of measles in Guinea. Irwin told IPS that in Guinea Bissau, one significant challenge is communicating the safety and importance of vaccines to sections of the population which remain sceptical, and in some cases concerned that vaccinations could be connected with Ebola. "The second phase of measles vaccination campaign was launched in Forest Region which is still recovering from the psychological trauma of the Ebola outbreak," Irwin said. "While there hasn't been a case that region for months, the UNICEF team and partners took the initiative to conduct a social mobilisation campaign ahead of the vaccinations to ensure that the turnout would be as high as possible." Health professionals remain vigilant for cases of Ebola, and are required to wear gloves when vaccinating - a practice not routinely required for administering injectable vaccinations in normal conditions. As part of the community-sensitisation campaign in Guinea Bissau, UNICEF has been conducting door-to-door visits to discuss vaccinations with parents. "UNICEF trained a former Ebola sensitisation team to go door-to-door explaining to parents that the vaccinations for measles were safe, essential, and not related to Ebola in any way," said Irwin. UNICEF health specialist Dr. Rene Ehounou Ekpini told IPS that Ebola had highlighted serious problems in Guinea's health system. "Firstly, it's a problem of poor distribution, with most health workers in the capital. At the second level, it's an infrastructure issue. "It's important to restore confidence in the health system," he said.